The western part of the church is the oldest, dating back to the 1200’s. In the first half of the 1300’s, an extension was added on the east. The church tower made of bricks was added in the 1400’s at the same time the nave received a brick vault roof. By the middle of the 1400’s, murals were painted. Further exterior additions date from the 1800’s, primarily the tower’s main steeple spire and the four corner spires. The church comprises a nave with the vestry attached on the north and the porch on the south as well as the large tower on the west. The nave walls are predominately natural stone with brick around the window openings and doorways. Under the eaves is patterned brick and the porch gable is more ornate with tiered blind man rings. 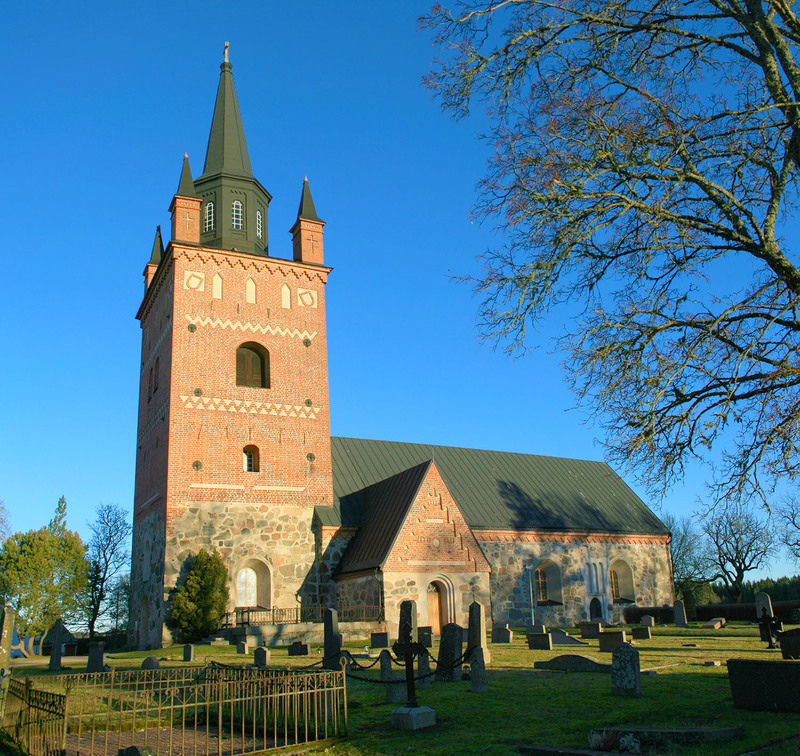 It is generally assumed the church was built in the 1200’s. It consisted of the western portion of the longhouse and the tower’s ground floor who’s original function is unknown. Originally, the church had a wooden barrel vault ceiling. Expansion in the 1340’s saw the addition of the sacristy and the rest of the church was expanded east. A new south door was opened, equipped with ‘rich iron hinges’ (ornate maybe?) and door. The expansion was complete with the dedication of a high alter in 1349. Probably between 1460-1470, three high gothic vaults of brick were added as well as stellar vaulting over the choir. Surviving paintings in both of the eastern vaults date from this period. Toward the end of the 1400’s, the tower’s brick walls were raised to an uncertain height. At the same time, the porch was added on the south. Over the centuries, 3 devastating fires have plagued the church. June 11, 1617, a lightning strike on the original steeple sparked a blaze. The fire spread to the nave roof, destroying valuable furnishings and melted the bells. July 4, 1701 the new spire suffered the same fate and was replaced with lower tower with a pyramid shaped canopy. Jan 1858, fire tore through the tower again. It was rebuilt to its present day appearance. The nave was given a new roof, covered in sheet metal. Between 1953 and 1954, the interior was given extensive restoration in accordance to architect, Carl Olof Deurell’s proposal.